Plot Summary: Honey Kisaragi is a perfectly normal beautiful high school student. Until her scientist father is kidnapped by the evil organization Panther Claw, that is. But her father left behind a device she can use to transform into the red-haired sword-wielding heroine Cutey Honey. 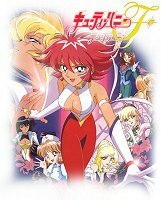 Unlike the original Cutey Honey, Cutey Honey Flash is a shoujo anime targeted for younger audiences. Instead of being a robot, Honey Kisaragi has the magical abilities to change costumes and become Cutey Honey. This series took over Bishoujo Senshi Sailor Moon Sailor Stars' time slot after the latter series ended its run.